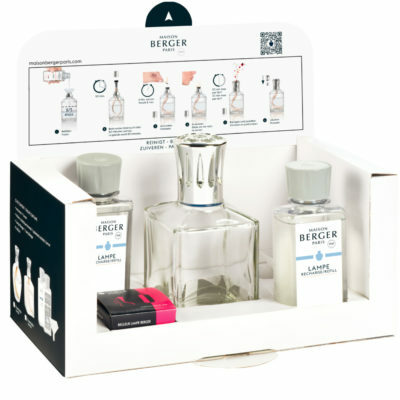 For all those lucky enough to own a Lampe Berger, the Pure Air-So Neutral fragrance refill is absolutely essential.In addition to purifying the air in your interior without diffusing a scent, it also allows you to adjust the intensity of your fragrance by diluting it. Lastly, the Pure Air-So Neutral fragrance refill will be essential for your Maison Berger Paris fragrance diffuser to work properly, as it will allow you to clean the burner between each fragrance. Once a month decant your fragrance back to it’s original bottle and replace with 1cm of Neutral – light, extinguish and use as normal. This housekeeping practice removes fragrance residue & elongates the life of your burner improving it’s performance. A great way to cleanse the burner between two contrasting fragrances, so there is no taint. Use Neutral to bespoke the strength of your fragrance.